Successfully Added 802.11N Wireless Router - 300Mbps (3 Antennas Edition) to your Shopping Cart. 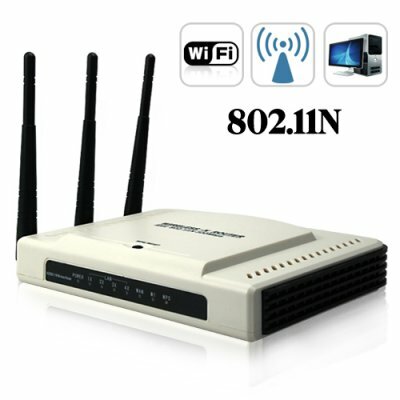 802.11N wireless router using the latest WiFi protocol and supporting data transfer speeds of up to 300Mbps. This wireless router comes with three powerful receiving antennas that always makes sure you are connected and surfing the internet at the fastest speed possible. What makes this wireless router special? This 802.11n wireless router is special because of the "N" in the 802.11n. Previous WiFi data transfer rate depended on the 802.11b and/or 802.11g. Although this wireless router supports both previous standards that are still being used today, it also supports the latest protocol of 802.11n. That means, instead of being limited to the 54 mbps data transfer rate you have now, you can be surfing at a blazing fast 300 mbps. That means 5x faster data transfer, meaning you can be streaming movies and reading all your favorite websites almost instantly! The 300Mbps 802.11N wireless router is in stock now and available for single and bulk purchases, Click "Add to Cart" now, and we'll ship you a sample the very next day. The CVOP-K73 300Mbps wireless router is brought to you from the leaders in China factory direct wholesale electronics, Chinavasion. Beside me question to Chinavasion, this adapter wi-fi possible to use only in set wi-fi, or his(its) possible use and without network wi-fi, will he works outside of network wi-fi? Nice router. was setup very quickly. Nice wireless range. improved my wireless network very well. A lot of options for the advanced. Very cheap and well worth the price. Thanks Chinavasion. fast shipping to the Netherlands, a good product, easy to set up and install. Now you can use your middle finger for sticking it to the MediaMarkt 'ik ben toch niet gek!! 'campaign. Be aware..., China is coming to Europe, bringing us good quality and low prices. Nice router just plugged it in and it worked perfectly right out of the box, just had to input my security code all done.